So you’re 40, 50 or even 60 something and realized that you haven’t done a thing to plan for your retirement. In previous years, retiring seemed like such a far off notion, that planning for it was likely pushed to the back burner. Fast-forward and now you’re dealing with a significant amount of debt and a very small nest egg (if you have one at all). Though financial experts might say you started late in the game, it is never too late to begin preparing for retirement. In order to do so, however, you will need to start immediately and develop the necessary discipline to learn how to effectively save money and prepare for a comfortable retirement. Before you can create an effective retirement savings plan, you’re going to need to get a real understanding on how much income you will need on the annual basis. According to CNN Money experts, you should look to save anywhere from 70 to 75% of your current annual salary in order to live comfortably. This will need to be calculated over the course of 20 to 30 years. So let’s say you and your spouse are comfortably living on $100,000 per year, $70,000 per year might suffice during retirement. This $70,000 will need to then be calculated by 20 to 30 years totaling roughly $1,400,000 to $2,100,000. While this seems like a large number, there are ways in which you can increase your savings to meet your retirement goals. Retirement Goal Tip: If you plan to do things during retirement such as travel the world, purchase your dream home, or start a business, it is suggested that you calculate these expenses into your overall savings goal. Budgeting for such expenses now prevents you from being financially strapped later on. A financial advisor can help you assess your ideal retirement budget as well as assist you in finding solutions to increase your savings. Very few people take the time to understand their financial accounts and benefits. If you’ve been investing in accounts through your place of employment such as pension or 401K accounts, now is a good a time as any to review those accounts. How much have you contributed, how much interest has the account accumulated, how close does this put you to your overall retirement savings goal? The more informed you are about your accounts, the better you can prepare yourself for retirement. Now is also a good time to learn more about your social security benefits. Determine how much you will receive per month during retirement to get a better understanding as to how much more you’ll need to save of your own income. Retirement Goal Tip: As you review your retirement accounts, consider increasing your contribution amount. For example, if you’ve been contributing 5% of your income per pay cycle, increasing it to 6 or even 7% can help to boost your savings in just a few short months. There is nothing worse than going into retirement in debt. Now is a good time to assess your personal finances and begin paying down your debts. Mortgages, car loans, student loans, and credit card debt can really eat away at your household budget. The more you’re contributing towards debt, the less you’re contributing towards your retirement. Come up with a debt repayment plan that will hopefully have you completely debt free within the next five years (sooner if retirement is right around the corner). Every time you pay down a debt, allocate those funds towards your retirement accounts and savings goals. Now is also a great time to think of lucrative ways to increase your earnings or grow your current income to help boost your retirement savings goals. In this digital age, there are plenty of options for earning extra income on the side. Start a freelancing business, do some odd and end jobs on the weekends, or if you have the time, take on a part time job. The income should not be included in your monthly budget, but should be solely for the purpose of getting out of debt and increasing your retirement savings. Sometimes increasing your earnings is not in the cards. There are ways in which you can still increase your retirement savings. Investing in stocks and bonds, real estate, and other endeavors can help your existing money grow over the next few years. Talk with a financial advisor about options for increasing your money for retirement. A living trust ensures that you identify your current and future assets and protect them in case instance of sudden incapacitation or death. Everyone, regardless of age is can be incapacitated or die. As you get older, of course that probably increases. So it is highly recommended to plan a living trust as it does not only benefit the wealthy but all individuals of all financial backgrounds and income levels. You can set up a living trust yourself by filling out your state trust forms but Orange County living trust law Firm Alavi & Broyles advises against that. According to their experience and research, each state has its own unique estate planning laws so they recommend you let a trusted estate planning attorney to set up your living trust for you. If retirement is really right around the corner, you may not have the time necessary to take the above steps. There are other financial options out there that can help you to get in a more comfortable position for retirement. One choice that is becoming popular is the use of a reverse mortgage. Applicants who are at least 62 years of age and own their home outright have the advantage of taking out a loan against the equity. A reverse mortgage calculator can help you to determine exactly how much you could qualify for. Though there are pros and cons to be considered, a reverse mortgage can provide you with a line of credit to pay down debts or supplement your retirement income for the next few years. The sooner you start preparing for retirement; the better off you’ll be financially. Set your retirement goals, assess your financial circumstances, learn more about your retirement accounts and benefits, pay down your debts, increase or grow your income, and most importantly, have a backup plan that will give you the comfort and peace of mind you deserve. 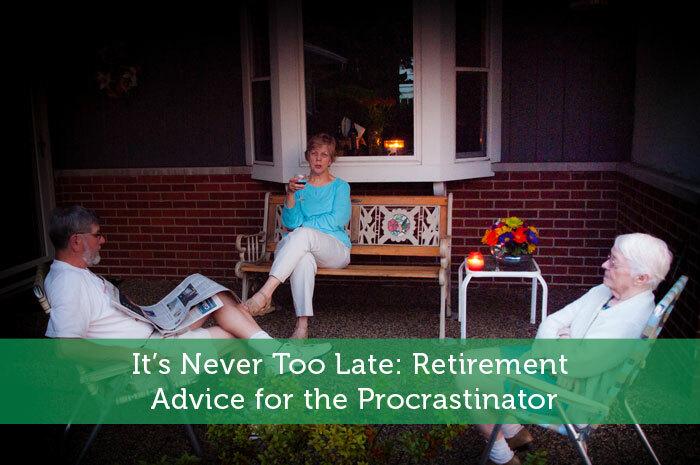 Whether you’re 40, 50, or 60 years old, it’s never too late to begin preparing for your future. Not sure where to start? Consulting with a financial advisor can put you on the right path towards safeguarding your future. Also check out this retirement calculator. By increasing your earning will definitely help you to be financially prepared for your retirement. You can do freelance writing or make your own blog. I like the idea that we can still do it, even if we’re not in our 20’s anymore. Most advice related to retirement is created for the very young, who have more time and more chances to get better retirement ‘numbers’. Even if we’re not that young anymore, focusing on our golden years is NEVER too late. The 70-75% rule is a little BS in my opinion. It assume a few things, like that you’re only saving ~5-10% of your earning. If you save more the this rule might make you save too much and end up working longer than you have to. Thanks for sharing this article. It’s very helpful information and insights here. I will share this information with my friends. It is never too late to start saving. Even if you won’t have your dream retirement, you can still have some version of a retirement if you start saving now. In my mind I would rather have this than no retirement at all. Potential retirees often sit on a massive home they purchased decades ago, which they still have a mortgage on. They can accelerate their retirement countdown by selling the oversized home and downgrading to a smaller place OR even renting for the remainder of their lives. Financially this helps in two ways 1) A large equity amount in their pockets to help them live as they like 2) A reduction in living expenses on a massive house (property taxes, utilities, maintenance). The tough part can be the emotional attachment to the old home, however, I suspect once the house is gone they wouldn’t miss it as much as they first thought.